Most days I have little idea what direction my painting is taking me. I like to think I do. However, it is a myth. What I have are intentions. My intention is to explore how my specific historical experience impacts my work with more conscious awareness. But right now, I have a long list of tasks that must be accomplished in preparation for three months travel in Europe beginning in April 2014. The round trip tickets are purchased. We are committed. I updated the most urgent items that must be accomplished to a separate list on Sunday morning. Then I set it aside. This is the fourth Twitter Art Exhibition, a concept founded by founder David Sandum, a Swedish-born artist living in Moss Norway, who conceived Twitter Art Exhibit as a vehicle for doing good through social media and online community-building. The idea is simple: artists around the globe receive a call through Twitter social media to create original postcard-sized art, which they mail to a local curator, who then exhibits and sells them to benefit a local charity. 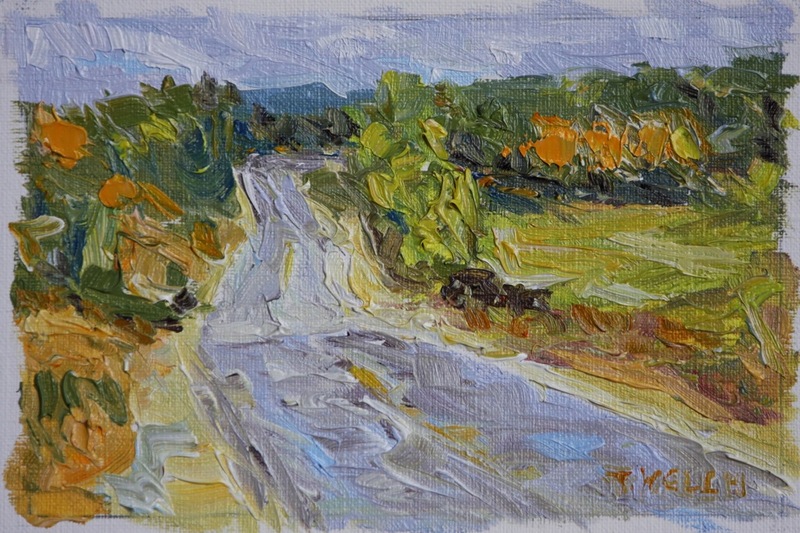 Here is my 4 x 6 inch oil on canvas paper contribution set aside to rest and dry before submitting it to this event. The postcard size works will be sold for $35 a piece and ones that do not sell on the opening night of the event will become available for online purchase. If you want to know more or would like to participate follow the hyperlink above or go HERE. After this, I picked up my list of urgent tasks…. well, not exactly. What can I say? There was paint on my palette? The sun hadn’t come out? I just couldn’t leave the easel? Choosing a 12 x 16 inch canvas with a dark purple ground I began to contemplate quiet despair, broken promises and how some moments are too sad for tears. Why this aspect of our human experience had surfaced was a blog post by Deborah Brasket “Some Tragic Falling off” into Difference and Desire. This post and our west coast weather. A January west coast afternoon. We haven’t seen much of the sun during the past few weeks. 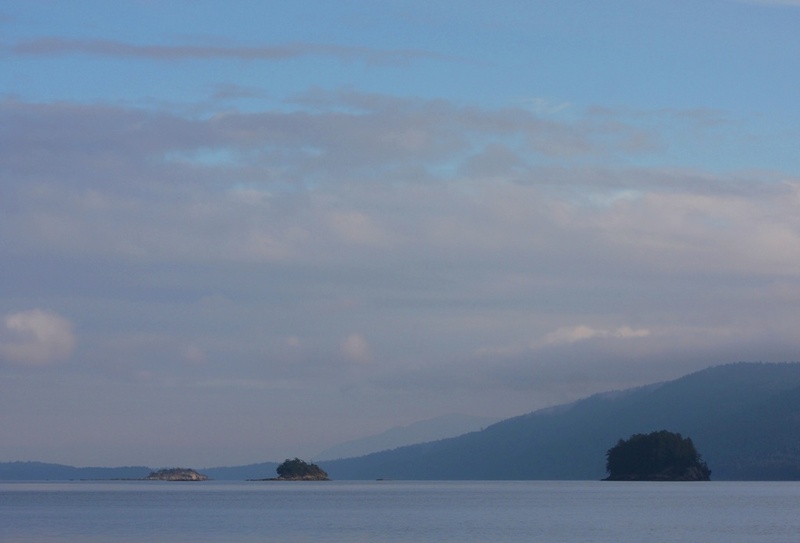 In fact, the fog has been hesitant to raise her skirts much above her knees on the island ridges. We can’t really blame her. After all, we have been gawking without shame, seeking even the tiniest glimpse of blue sky and sunlight between her cottony ruffles. Today though, within the deep winter quiet, we are given brief moments of reprieve from her dowdy grey garments. It was not a dazzling display but enough to leave us momentarily content, hopeful even. So I set to work. I like to think that I know my approach to a canvas and I am reasonably sure of the outcome. But I mostly just fool myself. My stubborn, overbearing intuition regularly slips the brush and palette knife from between my conscious breath and finds its own way across the canvas. The painting has a feeling all its own. My husband came in and said softly – oh, it is quiet. Then he smiled, satisfied, content even. More about this painting and links to purchase information on my website Terrill Welch Artist HERE. of undivided light” as in Robert Robert Hass’s poem “Meditation at Lagunitas” posted by Deborah Brasket? Now, before I dare pick up the brushes, that list. Where did I put that list? Thought-provoking writing and inspiring images, Terrill. Thank you for sharing them with me. My pleasure Leanne and equally pleasurable having you come for tea today. May we both get a chance now to go out and enjoy those blue skies and sun that at its striking best out the window. Terrill – oh, Oh, OH! Oh on so many levels. I love PROMISE and David’s response to it: “…oh, it is quiet.” Then he smiled, satisfied, content even. Laurie I had felt the painting was quite sad and forlorn as that had been how I had been feeling. But when David looked at it and his face transformed as if the painting was speaking his language I knew that the painting was what I was wishing, not necessarily what I was experiencing. I am pleased that you too enjoy it. I love your Walking the Autumn Road. Where does one go to see the entries and buy one? I also really like what you did with Promise… resting. You have really grown and I like your work. Sherwin you can view the entries as they are received and posted at http://twitterartexhibit.org . The first round of sales is a live in-person event in March. Then the ones that haven’t sell will be offered for sale online shortly there after. Hope that helps. Thank you for your feedback as well. I have had a good couple of solid years work that I am happy with. I am looking forward to this coming year to take it even further. 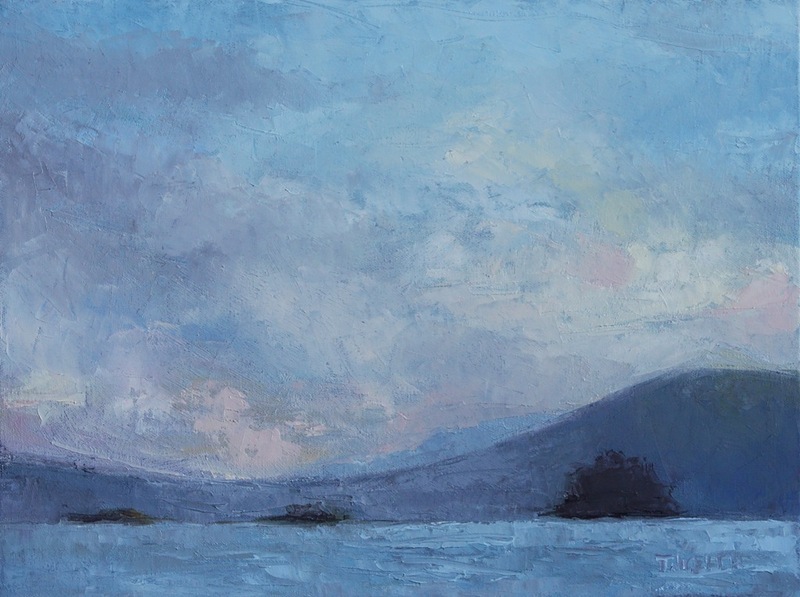 The postcard sized painting for the Center for Contemporary Dance is a fabulous cause Terrill, and your “contribution” no doubt will be ravished. “Walking on Autumn Road” is magnificent and the January west coast afternoon has a dreamy quality. Right now we are getting hammered by a major blizzard that they are predicting will drop a foot of snow on us here in the NJ/NYC area before morning. So I am presently thinking of a different kind of tapestry, though you do those such as exquisitely. Your Big Trip is drawing nearer and nearer. Have a great week! Those darn blizzards Sam and the crazy weather of the Eastern side of North America is something to be heeded. I just heard today about how the increased severity of the weather could be measured by increased amounts paid out in insurance claims this past year. Stay safe and I hope it only results in the playful addition a few extra snow angels. Sorry to hear that Patricia. I wish you a speedy recovery my friend! Glad to year you are up and about Patricia and don’t push it. Done only what comes easily and a swift recovery to you! 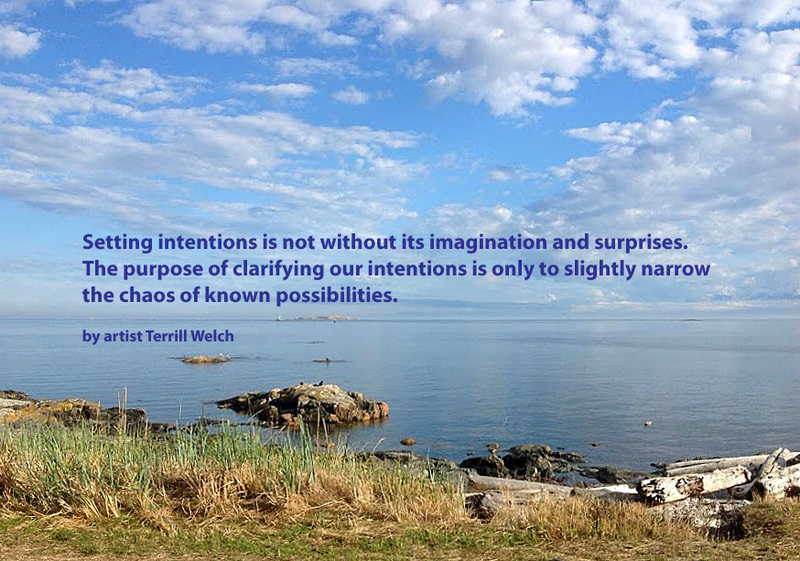 I love your quotation, the part about how clarifying intentions and how they “narrow the chaos of known possibilities.” You are so right, we can go in so many directions, but having a purpose, an intention, can help us choose which direction to go today. And I love the blue painting too–it doesn’t seem sad to me, but quiet and peaceful, and luminous, as if unlined by a blissful state of being. It captures the photo and transcends it to me–I feel the painting on a much deeper level than the photo, as beautiful as it is too. They really illustrate a point that I am coming to in one of my next posts about “Some tragic falling off.” I’d love to be able to use them to illustrate it, if you would allow me to use them. And I am humbly grateful to you for including my post link on your lovely pages here. Deborah thanks for asking and please do feel free to use the images as you have requested. You should be able to just download them from the post but if you have any trouble let me know and I will send them to you directly. And it is my pleasure to share the connect to your earlier post. It is a gem!